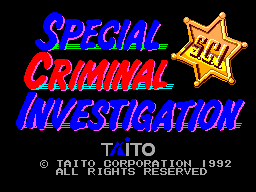 Sega8bit.com - Review: Special Criminal Investigation S.C.I. Review: Special Criminal Investigation S.C.I. Full Title: Special Criminal Investigation S.C.I. You are the police force's finest and you are up against criminals who will stop at nothing to carry out their plans. They've kidnapped the mayor's daughter and its up to you to get her back with your high powered car and arsenal of weaponry to drive the bad guys off the road. 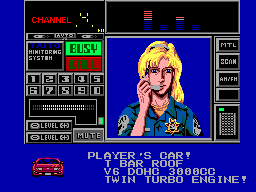 An entry in Taito's "Chase H.Q." series, this game is known as "Chase H.Q. Special Criminal Investigations" in some regions. The game was released in arcades in 1989 and was ported everywhere on to a plethora of home computers and consoles. The Master System's box art features a beautiful "Miami Vice" style painting made in the way many action movie posters of the period were drawn. 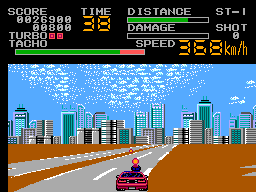 In each level of the game your goal is to intercept the bad guy's vehicle and force it off the road. First you have to race to it, avoiding obstacles such as landslides, roadworks, trees and cars driven by the associates of whoever you're after who try to ram you and all before the timer runs out. You are armed with a default weapon which can nudge cars out of the way but not destroy them. If you find you are losing to the clock then you can use one of three turbo boosts to make up the distance quickly. As you near the bad guy's vehicle a helicopter will swoop down and provide you with a weapon optimised for taking him out. You do have a limited number of shots with this weapon after which you revert to your default gun which requires you to get several hits on the bad guy's car before damage is registered on his meter. But if you really want to inflict some damage on him then ramming him is the way to go. Just make sure not to crash off the road or he will get away. Oh dear. Unfortunately, this game is severely let down in the graphics department. The artwork is as bare bones as they come on the Master System and the colours are often drab and unappealing. I suspect that this is a port from one of the older, less powerful micro-computers since the Master System is capable of much better than this. The road often splits in two and it just appears there, you're not led in to it. Also, at times as the road curves the corners of the screen begin to break up. Look at the bottom screenshot and you can see this happening on the bottom-right - those two shark-fin type things is it happening. Music is pretty good. There is a nice variety of tunes throughout the game that are catchy and complement the gameplay which is always important. Sound effects are minimal with blurps and blips. It is quite a playable game and it responds well to my inputs although having to fire the gun means that the throttle has been moved to UP on the D-pad which doesn't feel as natural as pushing button 2 (at least to me). It looks ugly but plays well which for me is more important. Sitting between the shooting and driving genres you do have to be in the mood for it. For me personally, I don't play it that often anymore. Given how late this came out (1992) I would expect this to have been a lot better than it is. It looks and feels more like a Master System game from 1988/89 and while it does play well, it is just so unappealing to look at which leaves you wanting. A bit more effort on the art and graphics and I think this would have been a winner. As it is it's just a little unremarkable in the SMS library. If you are going to buy then you can get it cartridge-only for less than �5. If you want it complete-in-box then you are looking more in the �10-15 price range but I wouldn't pay any more than that for it.